^ Farke, A. A. 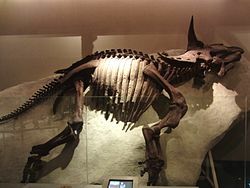 (2007) Cranial osteology and phylogenetic relationships of the chasmosaurine ceratopsid Torosaurus latus; pp. 235–257 in K. Carpenter (ed. ), Horns and Beaks: Ceratopsian and Ornithopod Dinosaurs. Indiana University Press, Bloomington and Indianapolis, Indiana.